Sor brought his Spanish culture to France where he spend most of his life, adding a French flavor to his compositions. Coste went on with the work of his teacher Sor respecting the Spanish school: an obvious combination. "Two nineteenth century celebrities of the guitar. Both were virtuoso performers as well as composers and, even though there was a generation between them, their music and their carreers have a remarkable amount in common. Sor, like Mozart, earned a good living from playing concerts, teaching and composing but, also like Mozart, he spent rather more than he earned and he too was finally given a poor man's funeral in July 1839. Sor gave his last concert one year before his death, together with his pupil Napoléon Coste. 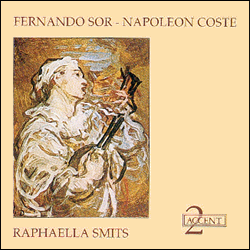 Napoléon Coste remained faithful to Sor in his compositional style which was even more romantic. Like his master Fernando Sor, he hated the easy effects of plucking open strings and continued to treat the guitar as a fully-fledged polyphonic instrument." "There are other currently available recordings of the works by Sor, but none that takes clear precedence over these by Raphaella Smits. The sum total of her attention to detail, sensitivity, controlled use of rubato, expressive vibrato, purity of tone and crystal-clear delivery is one which is matched by very few performances that are of the utmost refinement, character and authority, and which are superbly recorded." "This is one of the most refined recordings of the nineteenth century repertoire to reach me for some time. It is to Smits' eternal credit that she has reminded me through this recording that something worthwhile really did happen to the instrument between 1750 and 1900." "Smits sails alone just fine. There is a felicitous pace, as if she feels the notes without her fingers, or, better yet, knows how to dance with her guitar. Pretty playing indeed." "From the first note you're caught by Smits' playing. It's not just amazingly beautiful and correct, but she knows a lot to tell through the music. Romantic? Yes, but subtle and very convincing." "The development of the historical line from Sor to Coste takes place in this interpretation. That's why this disc presents a captivating evolutionary picture of sound of the 19th century guitar repertoire." "By means of her extremely sensitive playing, she works magic changing these compositions into real pearls thereby removing the last doubts about the possibilities of the guitar. We consider Raphaella Smits to be one of the great virtuosi of our country!"